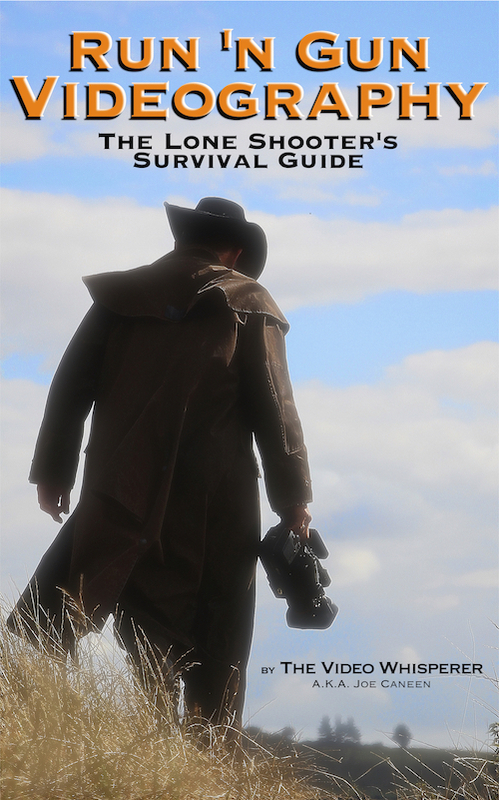 This blog was created, in part, as a supplement to the eBook Run ‘n Gun Videography–the Lone Shooter’s Survival Guide. The Supplements tab in the navigation menu will contain any such articles that are direct supplements to the book. My background, going back to 1979, is in cinematography and short video documentaries. In 2008 I decided to go solo and specialize in producing corporate videos because at that time it was predicted that the internet was heading in the direction of being mainly driven by video content. That meant that businesses would have to start obtaining video content in order to stay relevant and compete in the virtual market place. 5 years later that prophesy started to realize itself. By 2012 video content became the main subject of most marketing blogs. Mind-boggling stats are tabulated and shared regularly with an almost real-time documentation of this major shift. By ‘going solo’, I mean solo. I had no desire to build a large company or team with all its attendant infrastructure, administration and overhead. Even those that do desire that kind of future expansion, like any journey it starts with a single step. If you want to work for yourself, you have to walk the walk. It’s a lot more feasible than it used to be. Technology has advanced tremendously, and part of that advance has been the production of high quality equipment that is small, lightweight and affordable. What I used to carry around in 7 cases minimum (and one or two additional crew) I now carry in two cases, one small enough to fit in the overhead luggage rack on a plane. And that case has 4 cameras in it compared to the single large camera that used to be part of my kit. Furthermore, my two cases have everything I need including a full lighting kit and full audio kit and all the bits and pieces needed to make it all work. Equipment alone, however, does not make a successful videographer. I was fortunate to have both training and years of experience in both film and video production. Many new-comers in this burgeoning field don’t. Further, it’s my opinion that the basics are now longer taught outside of film school and there’s a mistaken importance placed on technical things (equipment, software) to the detriment of the purpose of any production which is to get a message across with clarity. That lead to the Video Whisperer blog where I’d occassionally share articles on different aspects of film and video production, and ultimately to writing the book, Run ‘n Gun Videography, the Lone Shooters Survival Guide. The book was written mainly for lone shooters and small production companies. It’s not a substitute for studying the basics of the subject, but it’s unique in that it succinctly covers the fundamentals necessary to appreciate the basics when you do study them or when you glean them from studying the work of other professionals in the field. It’s these fundamentals that seem to be missing from most modern how-to books, videos and blogs. As mentioned, the Run ‘n Gun Videography Blog is, in part, a supplement to the book. But I also hope that it will develop further into a go-to resource for lone shooters with guest articles on a variety of relevant topics, equipment reviews and more. Time, interest and demand will tell. Forgive me for trespassing on your valuable time Sir but I would like to bring this in to your kind notice that I bought your RUN ‘N’ GUN VIDEOGRAPHY e BOOK from Amazon last year around about 18-04-2015.Somehow I seem to have lost it from my computer Sir…I do not seem to have any master card payment record etc; etc’ but i DO HAVE A RECORD OF AMAZON ASKING ME TO WRITE A REVIEW OF WHAT I THINK ABOUT THIS BOOK DATED ( 18-04-2015 ). IS THERE ANYWAY I CAN DOWNLOAD THIS AGAIN SIR WITHOUT PAYING FOR THIS AGAIN. I prefer to read in print. Is that possible? Hi Jan, Right now no. Sometime next year I do plan to update and make available in print as well as ebook. You can download the free Kindle reader for Mac and PC and read it on a large screen meanwhile if that seems better than reading it on a little Kindle reader or iPad and the like. I think you will find that if you re-download the KINDLE READER using the same email address, the book will appear in your library again.You probably lost the Kindle reader, not the book. The book stays in your Kindle library. So open up the Kindle reader, or if you’ve lost it, re-download the free Kindle reader and you should have the book back.